The City Council approved a Concept Plan, but one resident wants to put it to a city-wide vote. King City's City Council unanimously passed a resolution adopting the King City Concept Plan at its April 18 meeting — a key step in eventually growing the city by 528 acres. According to a Metro Council-commissioned report by economic consulting firm ECONorthwest, the city will need to add nearly 1,000 housing units to keep up with growth over the next 20 years. In May, the city will submit a request to Metro Council — the regional government that oversees land-use issues — to expand the region's urban growth boundary around King City, which will allow it to annex new land into the city limits. The boundary, called the UGB, is the invisible line around Portland and its suburbs beyond which urban development is not allowed. The planned growth area is between King City and Roy Rogers Road, north of Beef Bend Road to the Tualatin River. 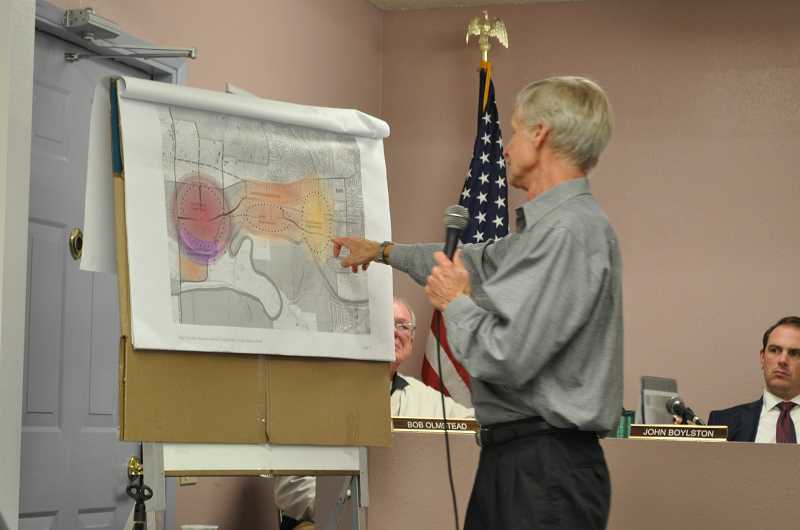 The King City Concept Plan — which was completed by SCJ Alliance and presented at the April 4 City Council meeting — includes a plan for four new neighborhoods in King City: a new Main Street/Town Center; a Beef Bend neighborhood to the east of Beef Bend Road; a central neighborhood close to the Tualatin River; and what planning consultant Keith Liden called a "rural character neighborhood" near the outskirts of the new city limits. Liden called the adoption of the Concept Plan "another step to get more clarity" in the UGB request process, and will show Metro Council that the city has done its homework in preparing for the request. He said the Concept Plan reflected three main priorities: not harming natural areas; keeping transportation fluid; and building a "community of great neighborhoods." But while the City Council is united in moving forward with the UGB request process, one King City man is doing all he can to put a stop to it. Brad Vandermark is the founder of King City: Small is Beautiful, a campaign aimed at putting a UGB growth on the November ballot, so that all King City residents can vote on it. He said he founded the campaign after he asked the City Council to conduct a thorough community survey on the issue, and was rebuffed. Vandermark is opposed to growing King City for a number of reasons, from the concern that a larger King City will become "less friendly, and less neighborly" to the possibility that a higher population will bring more crime with it. "For King City, based on the circumstances of how it was founded … it doesn't make sense for King City to expand," Vandermark said. He needs signatures from 15 percent of King City residents — that's about 500 people — to get onto the November ballot. But first he must face off against the City Council in a May 7 court hearing to determine if his process is constitutional. Vandermark said he doesn't have the required number of signatures yet, but his numbers are in the triple digits.